When you are planning any business or industrial process, one of the main considerations to bear in mind is the way in which materials are to be moved around. Inevitably, there are a number of calculations that must be made in this process, but the normal method of ensuring the best internal distribution is to use people. When you need to be able to carry out complex stock movements within a factory or other industrial facility, having well trained staff who are properly equipped to succeed is the foundation for efficiency. While there are modern technological solutions that promise full automation of the workplace, the best solution in terms of flexibility is still the hand trucks that have served industry for more than a century. Whether you want to move enormously heavy and unwieldy items around a warehouse, or have the need for small components to be taken out to individual work stations, hand trucks come in a form that is perfect for the task. 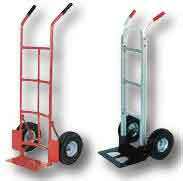 There are literally dozens of hand trucks and carts available that are perfect for a role within the workplace, and choosing the right one for your needs is often simpler than you would think. The first factor to consider when selecting the hand trucks that best fit in with your business model is the kind of loads that you need to move. 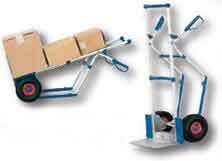 For large quantities of relatively heavy items, a flat platform truck is probably the best option. Steel versions offer up to 18 square feet of space, which is plenty for a number of boxes, and can easily carry up to two tons of components or other materials. Lighter and smaller components are better served with trolley style carts, which can carry the items on multiple tiers to prevent them from getting quashed, or to segment orders from staff into different areas, and make distribution simpler. With high clearance hand trucks with pneumatic tires available for outdoor use on farms and gardens, and trucks that have been designed especially to carry a specific kind of load such as plates of glass, delicate cartons, and even pipes available, there is no realistic excuse for not having the exact cart required for whatever job you need to do. One thing that is important to consider when choosing the right hand trucks for your business needs is whether you want them to be pushed or pulled. Push trucks are generally best for delivering stock such as components to individual work stations. Provided they are designed with two swivel casters, they are easy to control in use, although they are restricted to lower weights. For very heavy loads, pull carts are better, as the operator will find it easier to stop and start without losing control; however these can be unwieldy in use, and difficult to maneuver in small areas. The one factor that you can rely on with all the range of Easy Rack hand trucks is that you are getting the absolute highest quality products available anywhere at the best price going. As you continue to read through our selection of hand trucks, keep in mind we stand ready to answer any questions you may have about our offerings. Call us at 1-888-776-3720 whenever such questions arise and let us help you make the best investment within your budget. We are located in <?xml:namespace prefix = st1 ns = "urn:schemas-microsoft-com:office:smarttags" />Houston, Texas.